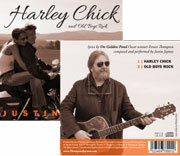 From Oscar winner Ernest Thompson and New Hampshire’s rock and blues legend Justin Jaymes, “Harley Chick” is all about hopping on a chopper and heading down a mountain road, finding a place to disappear and “dive in water warm and crystal clear.” Thompson and Jaymes, both longtime residents of New Hampshire, wanted to capture the Live Free or Die spirit and sensuality of ‘hauling down the highway … the wind whipping cool and slick,’ making ‘you come alive.’ And they did. The flip side, “Old Boys Rock,” is the perfect answer to the age-old question, “does passion diminish with age?” Not for Ernest Thompson and Justin Jaymes and not in “Old Boys Rock.” It just keeps getting better. Backed by veteran musicians Jared Steer on drums and Gardner Berry on keyboards, current Vanilla Fudge bassist Pete Bremy and world-renowned guitar maestro Randy Roos, “Harley Chick” will make your heart sing and get your blood pumping. Digital downloads now available at CD Baby and autographed CDs coming soon. Also coming soon to iTunes, Google Play and Amazon.